I've always been intrigued by the fact that a lot of the worldwide highest singles chart placings of music artists have been in the Irish singles chart. Between 1988 and 1989 Jason Donovan had five consecutive number one singles in the Irish charts. His debut single Nothing Can Divide Us in 1988 had gotten to number 5 in the UK but it was a top 3 hit here in Ireland, a chart position that it also shared in his native Australia. His duet Especially For You with Kylie Minogue was his first Irish number one in 1988 and his singles Too Many Broken Hearts, Sealed With A Kiss, Every Day (I Love You More) and When you Come Back To Me were all number ones in 1989. What is also noteworthy is that the first four of those number ones were all from his debut album Ten Good Reasons. In 1991 his cover of Any Dream Will Do also made it to number one in both Ireland and the UK. Here are all five of Jason's consecutive Irish number one singles from 1988 to 1989. First his duet with Kylie; Especially For You. In 1989 Hand on Your Heart became Kylie Minogue's second UK singles chart number following I Should Be so Lucky in 1987. It was her third number one here in Ireland as The Locomotion, I Should Be So Lucky and Hand On Your Heart all made it to the top of the charts here. Hand on Your Heart was written and produced by Stock, Aitken & Waterman. The 12" remix was by Phil Harding who remixed so many great SAW songs. SAW remixes often had brilliant witty names and the Hand On Your Heart remix had the name the 'Great Aorta Mix' which I always loved. Hand On Your Heart was taken from her second album Enjoy Yourself which really is pure classic Kylie. One of the many reasons why Kylie's fans love and respect her so much is how she still embraces all the songs that made her famous from the very beginning of her music career. All of her SAW singles and albums are all part of what made up a huge part of the pop charts in the 1980s. It was a time when they were in the UK, Irish and international charts as often as songs produced by Calvin Harris or David Guetta are nowadays. It's only ten days to the PWL Hit Factory Live concert in Hyde Park concert on Wednesday July 11th and it is wonderful that Kylie will be part of that day. Here is Hand On Your Heart (Great Aorta Mix). and Kylie looking so fabulous in the very colourful video. Little Mix have released a lyric video for their forthcoming new single Wings. It is instantly likeable pop. What I like about it is that it is pop without the crudeness. Apart from the very mild 'and if they give you shhh...' there is nothing crude in the lyrics of the song. It follows recent trends in pop lyrics that focus on thinking positive. It's obvious that all of the negativity that was directed at Jesy throughout the live X Factor shows through social networking sites has been turned around and made into a definite confident pop hit. Ever since girl groups like the Spice Girls and All Saints reinforced being positive role models for pop fans that message of girl power and overcoming the haters has been a big part of pop lyrics. I think Stronger by Sugababes is also a good example of songs like that. Wings is a song that doesn't even need a remix to do well. I can easily see it being a hit in the US especially with the recent success of British and Irish pop acts in the Billboard Hot 100. Do read this review by Nick on his pop blog The Re-View. I love the way he writes on pop. 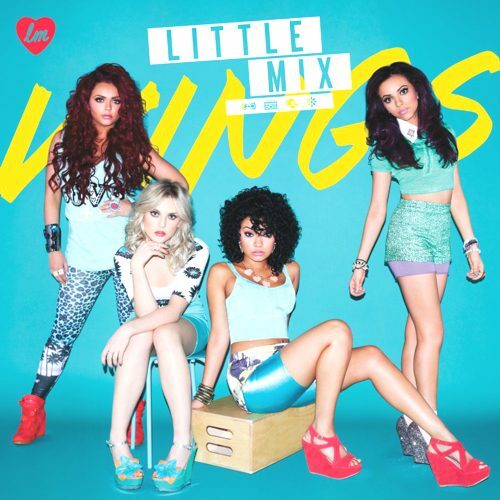 Wings is released on August 20th here in Ireland and on the 22nd in the UK.